When what matters most is at stake, you need more than a lawyer. When you are worried about keeping your home, protecting your child, or finding a path forward when big changes are happening in your life, you need a team who will take you to a better place. When people hear that we do divorce and we deal with disastrous debt situations, they say, “Your work must be so hard.” But for the Koenig|Dunne team supporting our courageous clients is inspirational. Helping people pick up the pieces of their life to make a new start. Bringing a family business back from the brink of financial ruin. Sheltering a child from the conflict of a custody battle. We do this work because its work we know matters. Our firm began in a little office across the street from the courthouse, with one of the three small rooms a nursery for the founder of our firm, Susan’s, first baby. Today we’re in two beautiful buildings filled with commitment to client care and professionals who love working hard together. Koenig|Dunne is a longtime leader in the change of the legal experience. We’ve written hundreds of blogs and even a book about the process of divorce in Nebraska that’s been replicated in 25 states. We’ve lectured countless places, from law schools and legal conferences to grade school classrooms. We’ve testified before the Unicameral to improve laws for Nebraska families, served on commissions, and provided community programs to help people recover after devastating life events. 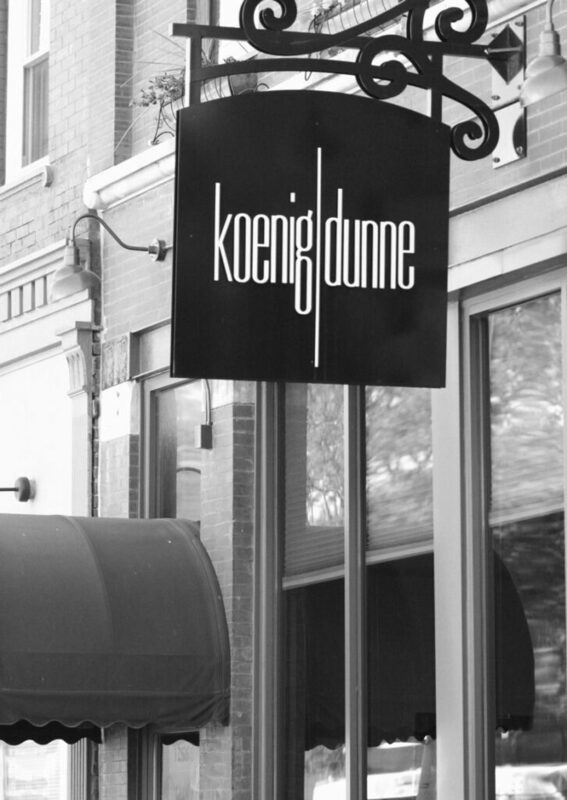 In short, Koenig|Dunne is more than a law firm. We’ve had a lot of big wins for our clients over these 35 years, like historic Nebraska Supreme Court victories in landmark cases. But our sweetest successes have been in supporting our clients with excellent advocacy to empower them to move forward stronger. Whether an amicable collaboration or lengthy litigation lies ahead, we’re the team who will empower you on your path to a better future, from start to finish. That’s a promise. Patched Up Parenting: A Guide to Co-Parenting by Angela Dunne. Inspired by her blog, Doing Divorce, Angela Dunne offers a guide to help overcome the challenges of post-separation parenting. She presents practical advice and tips and empowers mothers and fathers to parent better no matter the circumstances. This book is currently available for purchase on Amazon.com. Divorce in Nebraska: The Legal Process, Your Rights, and What to Expect, written by our partners, Susan Koenig and Angela Dunne educates and informs you so you can make the best decisions. It has answers to over 400 of the most common questions regarding divorce in Nebraska, from the initial consultation to the entry of your divorce decree. Find out what is going on with our team members as they make a contribution to their community and the legal profession. Koenig|Dunne is committed to sharing its professional knowledge and expertise with others. Read recent publications authored by members of the firm. See Koenig|Dunne highlighted in the community through as we made a contribution to the media and news sources.